The quest for the perfect TV has been around about as long as "rabbit ears" and while technology has changed, the desire to have your TV look good, perform good and offer some nice features has stayed the same. Today we have the LN40A650 TV from Samsung on the bench and give this 40" FullHD 1080p unit a test drive. This is an LCD TV that appears to be backlit by CCFL's and offers a dynamic contrast ratio of 50,000:1. It has a very wide viewing angle and a 4ms response time to boot. What sets this apart - other than the "Touch of Color" is the presence of an Ethernet port and the ability of the TV to display RSS feeds such as news, weather and stocks. While a 40" TV is probably considered small by quite a few people in this day and age, it is a perfect size if you have a smaller room and want other things to be the focus of your entertainment. 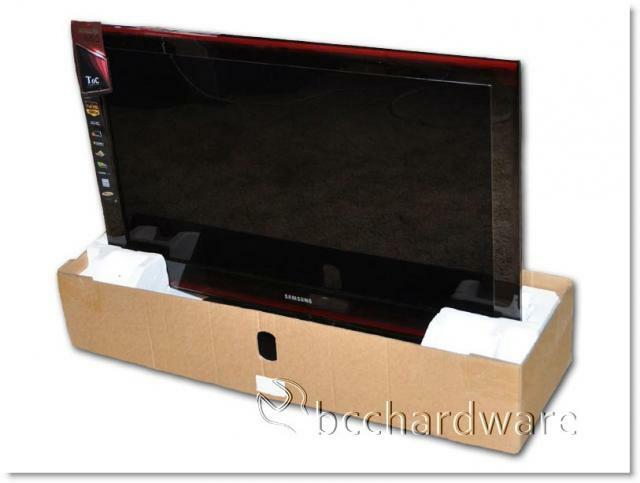 Buy flat screen TV now with Shopping.com's best deals on LCD TV and other electronic items. Before we really begin let's take a quick refresher course on LCD TV technology. A flat panel LCD is really a type of projector although not really recognizable in the traditional form. To generate the image that you see from your couch, fluorescent tubes have been used to shine light through a Liquid Crystal Display (LCD). The LCD panel is used to filter the light that reaches your eyes. Think of it in a very basic sense as a bunch of shutters that open and close. Using a fluorescent tube produce the light is a very rough approach and it results in a lot of wasted light as well as a lot of light bleeding through when you want a black color. With that being said, let's jump on in. Due to the much slimmer design of the TV over earlier units, the box that the LN40A650 comes in is actually quite slim and is easily managed by a person with gorilla arms. The overall weight of the unit is much less than my own 40" unit that features a heavy metal stand, aluminum bezel and more. The Samsung feels like a feather-weight in comparison. 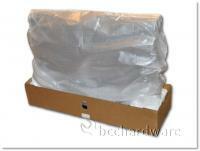 Although packaging was a bit light, the TV arrived in good shape - thanks to Fedex and our local Sears. Before we get too in depth with technical details, let’s take a quick look at the published specifications for this TV. Keep in mind that these numbers are produced under ideal circumstances and are not always indicative of real world performance. Introducing a truly unique HDTV - the SAMSUNG LN40A650 incorporates a stylish new look with exclusive Touch of Color™. Searching for technology that will make your life easier? The new InfoLink RSS feature gives you instant access to news, weather, and sports information at the push of a button. And Auto Motion Plus 120Hz™ delivers smooth motion action scenes that will blow you away. 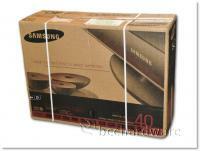 Satisfy your craving for the latest in HD technology with the SAMSUNG LN40A650 flat screen LCD TV. Make a statement with SAMSUNG’s new Touch of Color™ design. It features a hint of amber color naturally blended into the traditional piano black frame. Transforming our already stylish flat screenTVs into a work of art, it truly is unlike anything you’ve ever seen. Your action-packed sports and movies have never looked this real. Auto Motion Plus 120Hz technology virtually eliminates any motion blur and creates smooth transitions between frames. What’s the secret? Auto Motion Plus calculates the image between frames and inserts it, creating a non-repetitive transition from one to the next. The result is a clearer picture you have to see to believe. With just a push of a button you can access news, weather, sports and stock information. The InfoLink™ RSS feature gathers up-to-the-minute content from USA Today and displays it on your screen. Now you can always stay connected while watching TV anywhere in your home. Contrast and brightness levels achieve new heights in this LCD TV. Watch movies and shows come to life with enhanced details in very dark or bright scenes. Enjoy a more realistic, sharper picture quality that’s sure to catch your eye. With SAMSUNG's ultra clear panel colors are more vibrant than ever before. The brighter, clearer picture will definitely amaze you. Tired of annoying glare getting in the way of your movie-watching? Our ultra clear panel technology enhances contrast and reduces reflection so you can enjoy an overall outstanding viewing experience. By being ENERGY STAR compliant you are assured that your SAMSUNG model is helping the environment by using less energy while saving you money. ENERGY STAR is a joint program of the U.S. Environmental Protection Agency and the U.S. Department of Energy promoting energy efficiency. Of all of these specifications the 50,000:1 Dynamic Contrast ratio is the most interesting. You will notice that this number is far greater than the typical 10,000:1 or 5,000:1 contrast ratio that is typical of other LCD TVs. The other specifications are fairly normal and there is nothing else that is particularly noteworthy.